Born in 1952, I'm married and we have 3 children. This just to tell you who I am. But for sure you are more interested in my musical way ? From 1962 to 1968, I studied at the Music Conservatory in Ettelbruck (Luxembourg) and got the first price in musical theory and flute. At the end of this period I became interested in Jazz and switched to saxophone tenor and baritone by meeting my later mentors and friends, most best known saxophonists in Luxembourg : Ren BESSELING and Eugene BOZETTI. I got the Certificate Master Degree in flute at the Music Conservatory of the city of Luxembourg. I made my first album with ATMOSPHERE "JAZZ-ROCK". It is also the birth of ART SCENIC; for seven years, I played almost each Friday as a backbone of the famous Bistro ART SCENE in Luxembourg City. I meet the drummer and excellent singer Marcel DI PROSPERO from Luxembourg, release of the single "Flight of the Bumble Bee", featuring Hungarian guitar player Kalman SZIRMAI, arranged by Christian Jacob, a young, virtuous french pianist who became after his studies at the Berklee College, a Music Director of the legendary Maynard FERGUSON's "BIG BAND NOUVEAU". 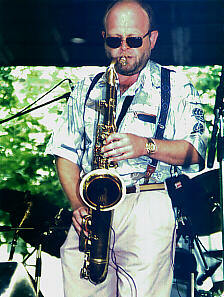 I participated to several concerts with : Sylvia DROSTE, Heyn VAN DER GEYN, Dee DANIELS and others. I also had Jam sessions with Birelli LAGREENE, Bruno CASTELLUCCI, Michael URBANIAK a.s.o. I met the pianist Dorel DORNEANU from Rumania. 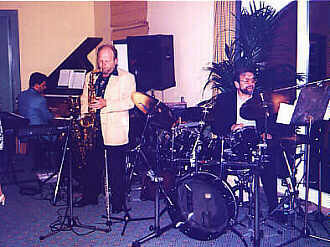 I was working as a soloist in Felix SCHABER's JAZZLINE, a kind of MANHATTAN TRANSFER with four singers. I performed with the Luxembourg Military Brass as a soloist at the C.L.M. I was a soloist of Ernie HAMMES's first CD "TRIBUTE TO BIG BAND". I also meet Chicho Schlime , a young and prodigious pianist (born in 1981) , whom I perform with up today. I became Program Director at the restaurant CULT MIX, Place d'Armes in Luxembourg City. GUY SCHADECK's QUARTET performs yearly at TRIER JAZZ FESTIVAL (Germany), LUXEMBOURG JAZZ RALLY and monthly with professional french sidemen at CULT MIX in Luxembourg City. I'm an admirer of Michael Brecker, one of the greatest saxophonists in the world. You should have a look to his page also. WOULD YOU LIKE TO LISTEN TO MY MUSIC ? You have the possibility to listen the file "MP3" or "AU". The MP3 is a streaming audio system what allows you to listen high quality music. IF YOU LIKE MY PAGES, TAKE A LITTLE MOMENT TO SIGN MY GUESTBOOK. THANKS! PLAY JAZZ IN LUXEMBOURG ! Graphics© and animated gifs© created by Guitta.